Was She Ever a Real Person? 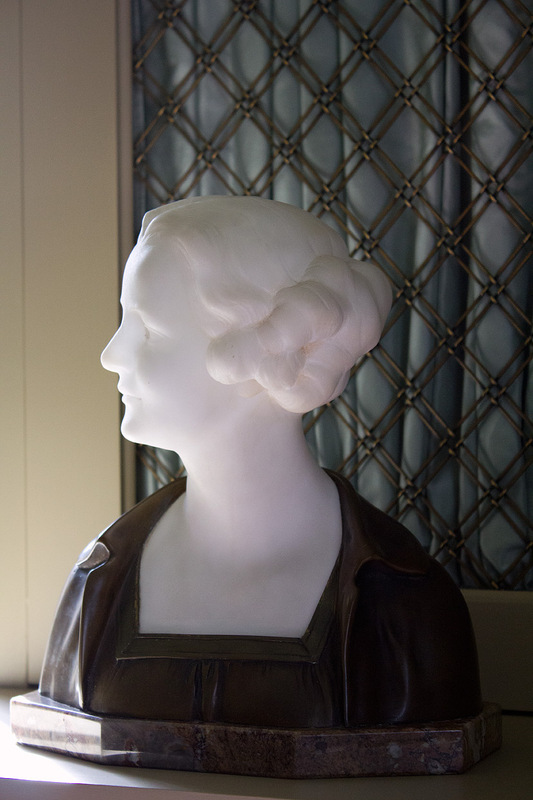 She was advertised as a rare 1920’s bronze and Carrara marble bust. A new addition for my library arrived today. I’ve been slowly collecting decorative objects for my front two rooms. This piece had been on my wish list for quite some time, because I had my doubts as to whether she would fit in. 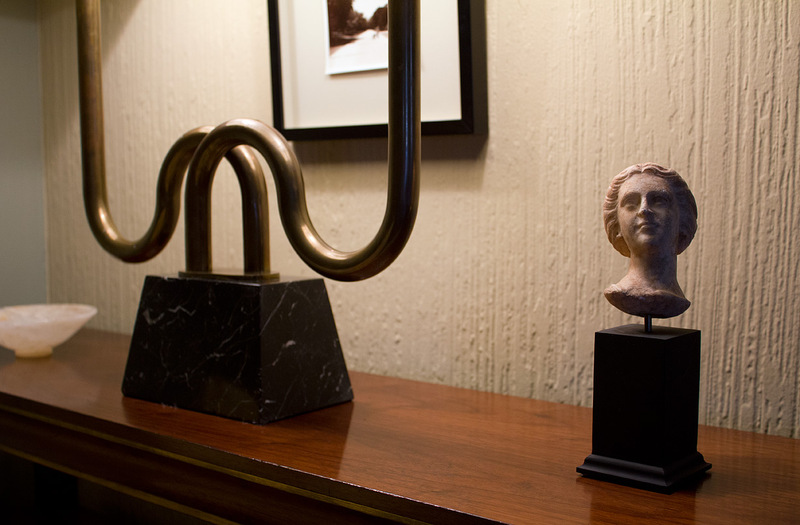 Most of my collected art is contemporary, but lately I’ve been drawn to antique works in sculpture and painting. It could very well be a phase, but I’m pretty sure I will never tire of these recent purchases. They’re here to stay, and I have plenty of room for more, whether it be fresh contemporary art that some of my guests may find disturbing or another dusty relic from a previous millennium. Click on the link below for one more photo of this beauty. A newly acquired classical artifact now resides on the couch’s end table. She’s an ancient Roman marble head dating from 100 — 200 AD which was found in Israel. Most of the Roman busts that I had researched to purchase had missing noses or diminished details. Not so with her. Her features are very beautiful still. I’m not sure that I like the display plinth. For one thing, the swivel pin is bent so that her head is tilted slightly back. So if you were to look at her at eye level, she looks like she’s purposely tilting her head back to gaze upwards. I don’t think this was the artist’s intention. Perhaps the gallery set her this way so that she’s best viewed from above while resting on a tabletop. For more photos of this beauty click the link below. Except for me and the house, she’s the only antique in this setting. This portrait of an unknown lady is a lucky find for me. 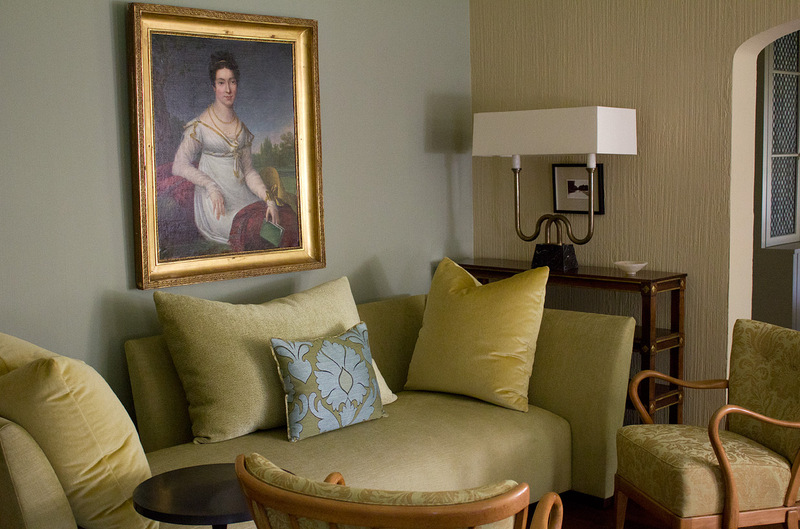 Ever since Elle Decor published designer Jean Louis Denoit’s Paris apartment, I have been fascinated with his way of mixing eighteenth-century portraits with rich contemporary settings. So I decided to be unoriginal and copy this concept. My painting is by François Joseph Heim, and going by the style of her attire and accessories, it was most likely painted between 1805 and 1810. Since he was born in 1787, this would have been created very early in his career. To see a closer view of her, click on the link below.